Crêpe filling recipes may sound scary, but they are actually pretty easy to make. Although crêpes are simple and can shine equally bright in either savory or sweet menu courses, few cooks include them as a regular part of everyday meals. Despite its elegant French name, a crêpe is merely a very thin pancake dressed up with fillings, sauces or both. A crêpe usually contains no more than five or six ingredients: flour, eggs, water, milk, melted butter, and if making sweet crêpes, adding a bit of sugar to the batter is acceptable. The method to crêpe-making, intimidates many cooks more than the recipe itself. While a crêpe pan is a nice kitchen tool, a good quality, heavy non-stick skillet, a minimum of eight inches in diameter, works just as well. Lightly spray the pan with an unflavored cooking oil and place the pan over medium-high heat. When it is hot, ladle a quarter cup or so of crêpe batter into the pan and immediately swirl it around to coat the pan bottom. When the top is dry, which usually takes about twenty to thirty seconds, quickly flip it over and cook the other side for five to ten seconds before removing it from the pan. Repeat until you have the desired number of crêpes. Try a few savory recipes as well as some sweet ones to practice your technique and perfect different filling mixtures. Poach eggs to your preferred taste. While the eggs poach, make the Hollandaise sauce (recipe follows). Divide the cheese and ham equally among the crêpes, and fold them in half to cover the fillings. Place in a non-stick skillet over medium heat and cook on both sides until the cheese melts. Transfer crêpes to plates, and fold to form quarters. Top each serving with a poached egg and Hollandaise sauce. Sprinkle with salt and pepper and garnish with a sprig of parsley or a few strands of fresh chives. Mix vinegar and peppercorns in a small pan and bring to a simmer over medium heat. Reduce the mixture to one tablespoon, and remove peppercorns. Place egg yolks into a blender, and mix on high. With the motor running, slowly add the vinegar mixture and butter until the mixture emulsifies and becomes thick. Adjust seasonings and pour over poached eggs. This recipe begins with a béchamel sauce, which can be made ahead of time, refrigerated and slowly reheated before adding the other ingredients. Over medium low heat, melt butter in a heavy saucepan. Whisking constantly, add flour and cook for around five minutes. You want the sauce to be a light golden color, but you do not want to brown the mixture. Gradually whisk in milk, continually stirring until the sauce is smooth. Increase the heat and bring to a slow boil. Stirring constantly with a wooden spoon, cook for another eight to ten minutes until the mixture is smooth and thick. Off the heat, season the sauce with salt and nutmeg. Add onions and mushrooms, and sauté one to two minutes, until the onions are translucent. Add asparagus and cook until they are lightly caramelized, about five minutes. Mix vegetables into the sauce, reserving a half-cup of sauce. Divide sauce mixture evenly among crêpes and place seam-side down in a shallow baking dish. Top with reserved sauce and bake at 350F degrees for 10 minutes until bubbly and heated through. Place the rack in the center of oven and preheat it to 350F degrees. 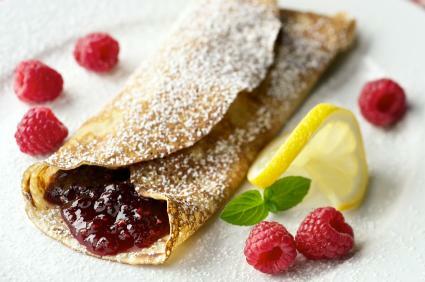 Evenly spread one or two tablespoons of the preserves on the surface of each crêpe, and top with the grated chocolate. Fold each crêpe into quarters and place on the cookie sheet. Loosely cover the crêpes with foil, and bake until the chocolate melts, about eight to ten minutes. Drizzle with sauce before serving. Purée one thawed, twelve to fourteen-ounce package of sweetened raspberries in a blender. Strain through a sieve to remove seeds and serve. Place the rack in the center of the oven, and preheat it to 425F degrees. Blend flour, sugar, butter and cinnamon with a pastry blender or fork until crumbs form. Divide pie filling equally among crêpes, roll up and place seam-side down in lightly-greased, shallow baking pan. Sprinkle with crumb topping and bake until golden, about 20 minutes. Top with ice cream and walnuts before serving. Crêpe filling recipes can transform plain ingredients into elegant entrées or desserts. Mix and match your favorite foods to create dishes that impress your guests in both taste and staging.